Roman “Chocolatito” Gonzalez (47-2, 39 KOs) got back to his winning ways earlier tonight (Sat., Sept. 15, 2018) live on HBO pay-per-view (PPV) from inside T-Mobile Arena in Las Vegas, Nevada, when he put a brutal stop to super flyweight Moises Fuentes (25-6-1, 14 KOs) via fifth-round knockout. While Gonzalez had his way with Fuentes throughout the first four rounds, the fifth showcased his most meaningful shot. During an exchange in the corner, Gonzalez slammed a beautiful right hook into Fuentes’ chin which instantly put the 32-year-old Mexican out. 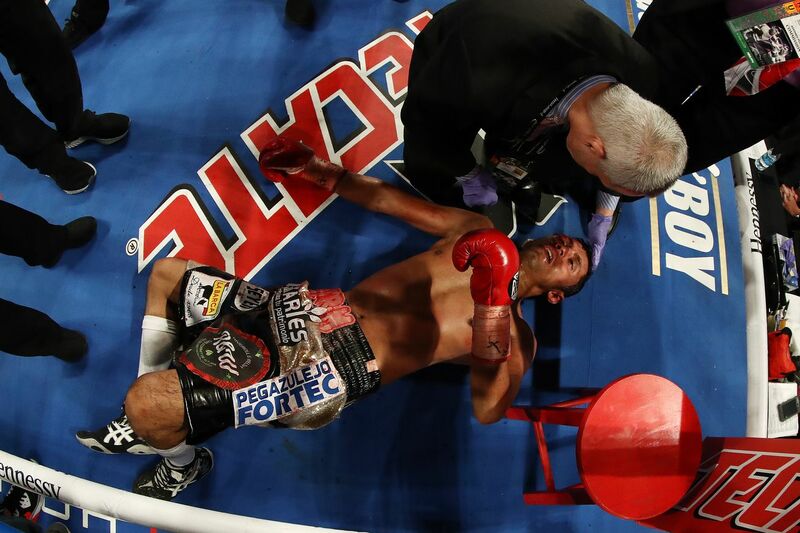 The aftermath of Gonzalez’s knockout blow left Fuentes on his back for an extended period of time. Check out the video replay above. With this victory, Gonzalez re-enters the win column after suffering back-to-back loses to Srisaket Sor Rungvisai, including a knockout defeat one year ago. Those were the first losses in the career of “Chocolatito” so it’s nice to see the 31-year-old rebound in memorable fashion. MMAmania will deliver LIVE coverage of “Golovkin vs. Canelo 2,” starting with the HBO Boxing pay-per-view (PPV) broadcast at 8 p.m. ET. You can also watch a live stream of the undercard here starting at 6 p.m.